Opponents rally in West Capitol Park to oppose final permitting of the Competitive Power Ventures (CPV) pipeline for fracked gas in Orange County Thursday August 10, 2017 in Albany, NY. Photo by John Carl D’Annibale. Reprinted with the permission of the Albany Times Union. See Times Union story for background. 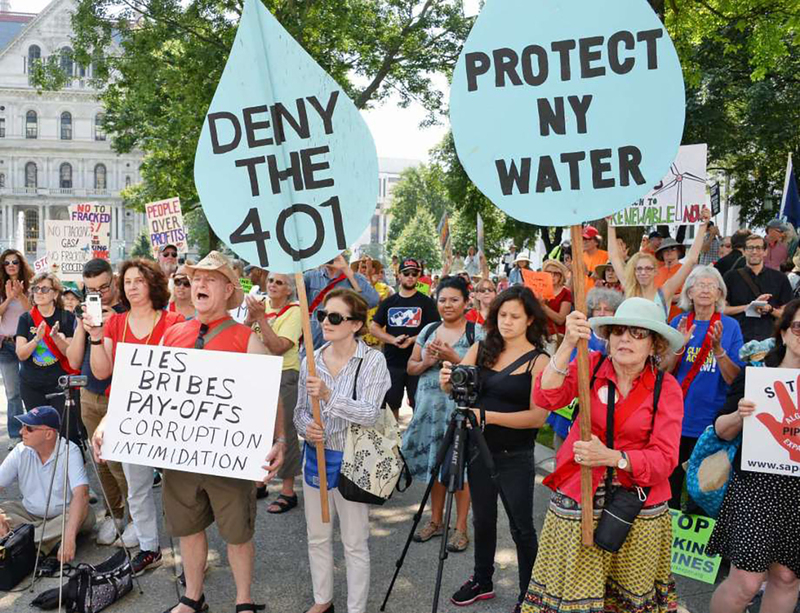 In a September 15 decision that upends this core governance principle, the Federal Energy Regulatory Commission (FERC) overruled New York State’s denial of a water quality certification for the Hudson Valley segment of the controversial Millennium Pipeline. Although the state Department of Environmental Conservation (DEC) action was issued within one year of a revised application by Competitive Power Ventures (CPV), FERC ruled that DEC should have acted within one year of the CPV’s initial application, no matter how deficient that might have been. The FERC decision may be a preview of a federalism even more breathtaking in its disregard for the federal-state compact created by a bipartisan Congress in 1972, according to Professor Karl R. Rábago, executive director of the Pace Energy and Climate Center, at Pace’s Elisabeth Haub School of Law. We knew FERC was essentially a rubber stamp for gas pipeline approvals, under both Democratic and Republican administrations. This decision may reflect an even darker turn. By overruling DEC based on a dubious interpretation of the procedural time clock rules applying to the Clean Water Act Section 401 certification processes, FERC did two very bad things. First, it substituted its interpretation of the Act for that of the state agency charged with enforcement of the law under what used to be a system of cooperative federalism. Second, by hiding behind a procedural issue, it completely ignored the important substantive reasoning behind the DEC’s denial of the 401 permit. This was a two-footed, full jumping stomp on state’s rights. States that want to protect their citizens and preserve their environment should be very worried. Legal experts predict New York environmental regulators will appeal decision. Federal energy regulators undercut a New York environmental agency Friday, allowing a pipeline company to go forward with a project the state had previously blocked. The Federal Energy Regulatory Commission (FERC) granted a natural gas pipeline company permission to move forward with its project, even though the New York State Department of Environmental Conservation refused to grant the company a water quality permit required under the Clean Water Act. Under section 401 of the Clean Water Act, states must certify that a pipeline will not violate clean water standards before construction on that pipeline can begin. FERC ruled the state failed to meet a statutory one-year deadline to act on the permit request and therefore waived its authority to issue a decision on the application. Pipeline opponents criticized the federal commission’s ruling to overturn the state environmental agency’s decision. Millennium Pipeline’s proposed Valley Lateral Project, if built, will consist of almost eight miles of pipeline that will feed huge amounts of natural gas to a 680-megawatt power plant in Orange County, New York, under construction by Competitive Power Ventures. In a similar case, Constitution Pipeline, whose primary owner and developer is Williams Partners LP, sued in May to overturn a water quality permit denial from the New York DEC. Last month, U.S. Court of Appeals for the 2nd Circuit sided with the state, saying it acted within its authority to deny the permits. But after FERC’s decision in the Millennium Pipeline case, other industry officials are growing optimistic about getting their water permit denials overturned. Williams spokesman Chris Stockton said Constitution Pipeline is now planning to seek a similar Clean Water Act section 401 waiver determination directly from FERC. National Fuel Gas Supply, another owner of natural gas pipelines in New York, sent a letter to FERC last week asking the agency to overturn the state DEC’s denial of a water certificate for its Northern Access project, which runs from Pennsylvania to New York. FERC’s ruling was unanimous. President Donald Trump’s two Republican appointees to the commission — Chairman Neil Chatterjee and Commissioner Robert Powelson — joined Cheryl LaFleur, a Democratic commissioner, to vote to overturn the state agency’s ruling. On August 30, the New York DEC denied Millennium Pipeline’s request for a water permit to build its Valley Lateral Project. In its rejection, the state agency cited a recent court decision in which FERC’s environmental review of a pipeline project in the southeastern United States was found to be inadequate and deficient. For FERC, though, its decision in the Millennium Pipeline case came down to the timing of the state agency’s rejection of the company’s application. The DEC argued that it had one year from the time it deemed the pipeline company’s application complete to issue a decision in the case. The state agency designated the application complete on August 31, 2016, after it had received additional information from the pipeline company. However, FERC sided with Millennium Pipeline that the clock began running on November 23, 2015, when the DEC first received the company’s application, and that the state agency had until November 23, 2016, not August 31, 2017, to issue a decision on the water quality certification application. The Clean Water Act specifies that if a state agency “fails or refuses to act on a request for certification within a reasonable period of time (which shall not exceed one year) after receipt of such request, the certification requirements of [section 401] shall be waived with respect so such federal application,” FERC said in its decision. To support its decision, FERC highlighted a pair of prior decisions in which it concluded that the clock started running once a state agency received a water quality permit application, not when the state regulatory agency concluded the application was complete. The agency cited a ruling it made in 2004 in which it overrod the Washington Department of Ecology’s denial of a natural gas pipeline company’s certification request; the state agency issued its decision “more than two years after receipt” of the pipeline’s application, FERC said. Under FERC’s decision, though, a company can simply submit a “super-thin application,” saying, ‘Hey, we want a permit,” Nasmith said. “There’s nothing to stop that from happening now, except that I have no doubt that FERC’s decision will be challenged,” she predicted. The courts have held that such a type of application cannot be what starts the clock running for regulators who are considering whether to grant a water quality permit, Nasmith said.